To help you decide whether it’s worth taking advantage of the Platinum Delta Amex card’s currently elevated sign-up bonus, TPG Senior Points & Miles Contributor Nick Ewen takes an in-depth look at the value you can get from its companion certificate benefit. Earlier this month, we wrote about increased sign-up bonuses through July 6 on both the Gold Delta SkyMiles Credit Card from American Express and the Platinum Delta SkyMiles Credit Card from American Express. Both cards offer a solid value proposition, and I recently wrote a post to help you analyze which would be the best to add to your wallet. In that article, I noted the key differences between the cards, and today I want to highlight one in particular. How can you make the most of the companion certificate that you’ll earn every year after renewing your Platinum Delta Amex? 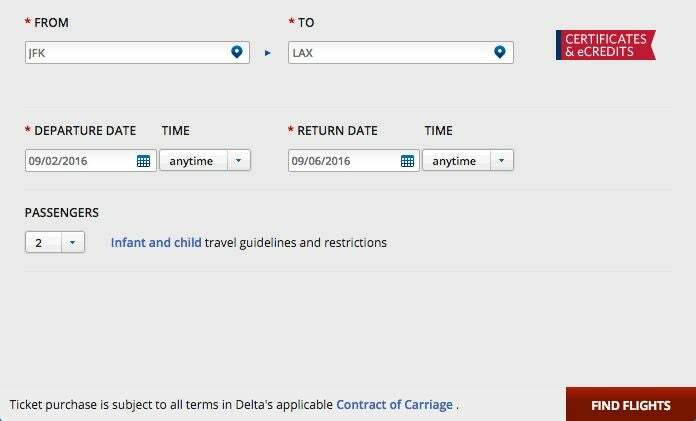 You and a companion could enjoy a significant discount on a Delta flight with this perk. Image courtesy of PRNewsFoto/Delta Air Lines. However, before getting into those strategies, I want to go through this benefit in detail to make sure you understand what’s allowed (and what’s not allowed) before you “waste” a hard pull and apply for a card with a perk that you won’t eventually be able to use. For starters, remember that the benefit only comes when you renew the card and pay the second year’s annual fee. As a result, you’ll actually need to pay two $195 annual fees before you have access to the Companion Certificate. This actually applies to residents outside the lower 48 states as well. If you live in Hawaii, Alaska, Puerto Rico or the US Virgin Islands (and have a mailing address in your SkyMiles account to prove it), you can originate from your home state or territory and travel to the 48 contiguous United States using the certificate, though again it’ll need to be a round-trip flight. These tickets are limited to coach and (unfortunately) not eligible for first-class upgrades. The companion ticket can only be used on Delta-operated flights in L, U, T, X and V fare classes. Note that this excludes Delta’s relatively new Basic Economy fares (E class) and the higher coach fare classes like Q and K. You’ll also find that the card’s terms and conditions on American Express’ website only lists L, U and T as eligible fare classes, but this is simply outdated. You will earn SkyMiles; your companion will not. Neither ticket is eligible for upgrades of any kind. This includes mileage upgrades, Platinum upgrade certificates and Medallion complimentary upgrades. 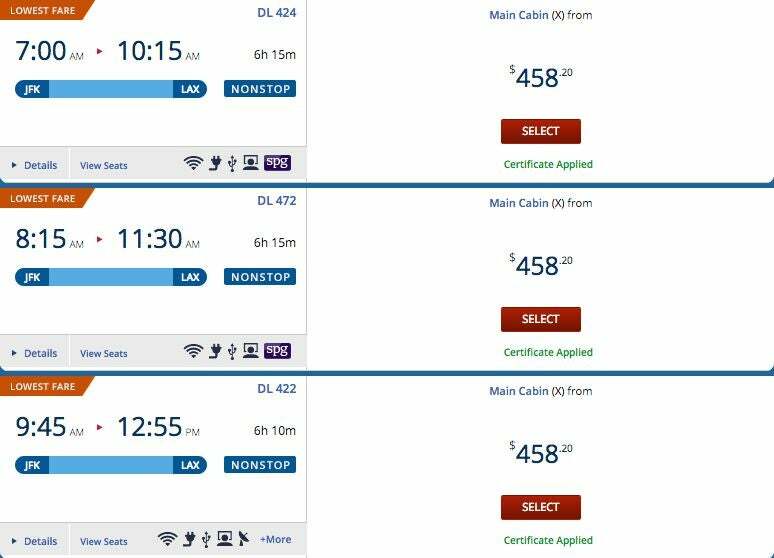 You must pay for both tickets with your Delta SkyMiles Credit Card. This (unfortunately) prevents you from using another card that gives you a solid return on airfare purchases like the American Express Premier Rewards Gold Card. Both passengers must be booked on the same flights on the same dates at the same time. You must book AND complete travel by the expiration date on the certificate. No stopovers or open jaws are allowed. You are thus limited to simple round-trip itineraries. You will forfeit the companion certificate if you cancel the trip. The primary ticket can still be applied toward a new ticket (less a $200 administrative service charge). You can change the itinerary, though you’ll have to pay a $200 change fee per ticket. As you can see, these are some pretty hefty restrictions, but it’s essential to understand them to make sure that this benefit is useful to you. Now that you have an understanding on what you can and can’t do with the companion certificate, let’s take a look at the actual process for booking a ticket. The certificate should post to your SkyMiles account in your renewal month, and it’s generally valid at least through the end of that month the following year. You can actually redeem this ticket online, much like the companion fare benefit on the Alaska Airlines Visa Signature credit card, so it’s a relatively simple process. 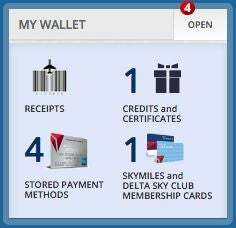 Start off by logging in to your SkyMiles account and click on Go To My Delta. Find the My Wallet section and click on Credits and Certificates. 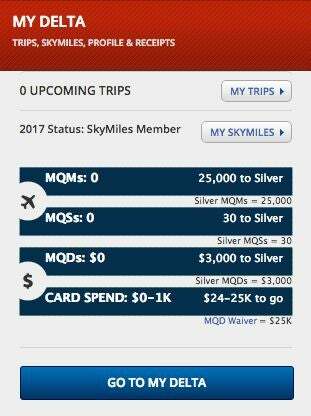 You’ll see that the companion certificate will be displayed (along with any other vouchers or upgrade certificates associated with your SkyMiles account). To begin the booking process, check the box for your companion certificate and then click Continue (you may need to click Continue twice to accept that the certificate you’ve selected is the primary one for this booking). Enter your departure city, arrival city and dates and click Find Flights (you’ll notice that the passengers drop-down will only allow you to book for two). Find your desired outbound flight from the results and click Select. Find you desired return flight from the results and click Select. Review the itinerary, and if all looks good, click Continue to begin finalizing and paying for your ticket. Remember that the terms and conditions indicate that you must pay for the ticket with your Platinum Delta SkyMiles Credit Card from American Express, though I’ve read reports of travelers using a different card without any problems. Nevertheless, it’s probably not worth running the risk of using a different card only to have the itinerary canceled. In this case, the Companion Certificate would save me $430, more than double the annual fee on the card. This strategy is especially applicable if you book multiple flights in a given year, as you should do your best to apply the certificate on the one that would be most costly. Wouldn’t you hate to use it on a flight with a base fare of $250 only to then pay full price for another with a base fare of $500? Another good strategy is to use the certificate on flights where you stand little to no chance of getting an upgrade as a SkyMiles Medallion member. Remember that neither the primary traveler nor the companion are eligible for complimentary upgrades on these tickets, so you might as well book those routes that are popular for business travelers and carry minuscule chances of being upgraded. This is especially true now that Delta has changed the upgrade policy for regular paid companions. For example, let’s say that you were a Gold Medallion and had to choose between booking the above flight from New York-JFK to Los Angeles or a similarly priced flight from Atlanta to Seattle. While your chances of clearing a complimentary upgrade on the latter option is small, you have no shot on the transcontinental flight. Delta Comfort+ is also not an option with the companion certificate, making short-haul flights a bit more attractive. This one may seem to be at odds with my first strategy, as shorter flights may not be the most expensive ones. 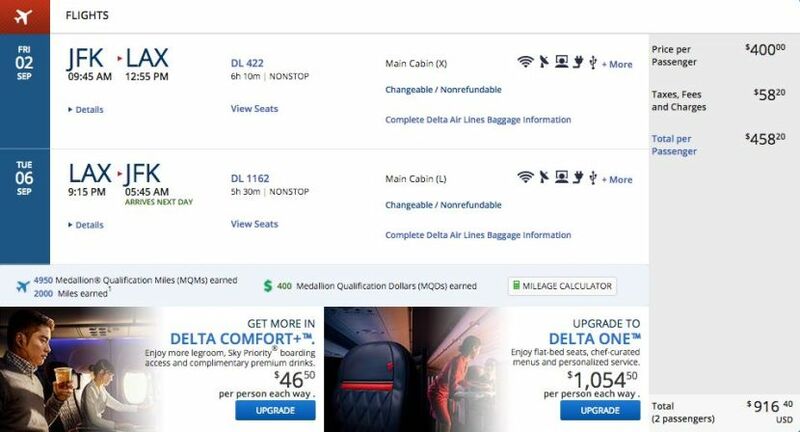 However, it’s important to remember that as of May 16, Delta now treats its Comfort+ seats as a separate fare class. As a result, you now need to upgrade to Comfort+ rather than just select the seat at check-in. If you’re following my logic, that means that you can’t sit in Comfort+ seats when you book an itinerary using your companion certificate. I’m guessing you’d rather suffer in regular old coach on a shorter flight than a longer one. This final strategy relates to the fare class restriction on Delta flights, since you’re limited to the lower tier of coach fare buckets when using the companion certificate. While many airlines may open up award seats at the last minute, the chances of finding L, U, T, X or V inventory within a few weeks of departure is relatively slim. By booking months in advance, you can have a greater selection of flights. Just remember that if you book far in advance, you better keep the tickets intact! If something comes up and you must cancel the ticket, the companion certificate won’t be reissued. 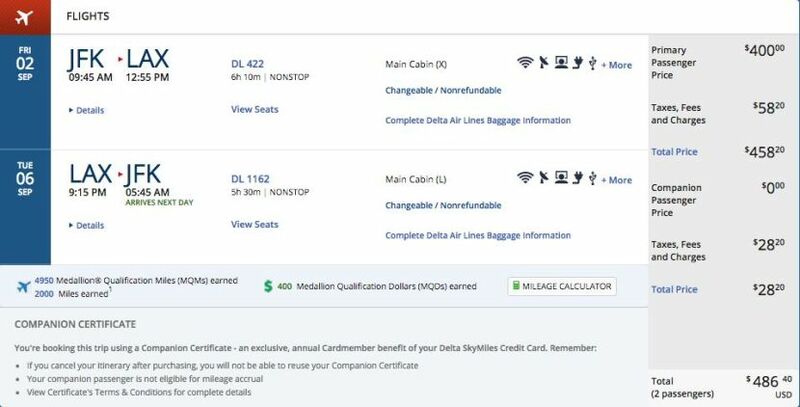 The companion certificate benefit on the Platinum Delta SkyMiles Credit Card from American Express can be very valuable, even if you only travel on Delta a couple of times every year. Just make sure that you understand the full terms and conditions of this certificate, and remember that you won’t get your first one until you renew the card and pay the second year’s annual fee. Now’s a great time to apply for this card given the increased sign-up bonus, and I hope this post has shown you how to get value out of card beyond year one! Have you used the Platinum Delta Amex companion certificate? Share your experiences below!